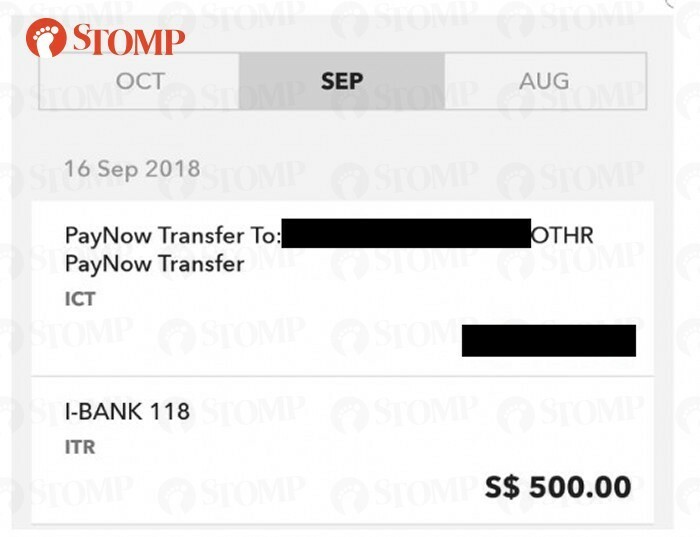 Needing extra funds to tide her through a tough period of time, Stomper Anon turned to a moneylender -- but ended up losing more money than she managed to borrow. She said that she started getting texts from the moneylender in early September, offering "financial assistance" with what she thought were reasonable-sounding "installment plans". 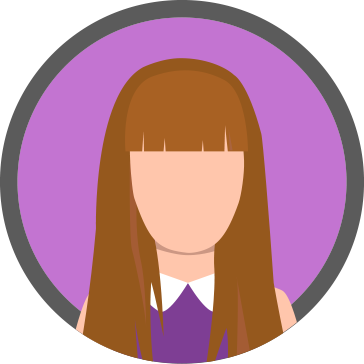 Asked what drove her to borrow from the moneylender, Anon said: "I wanted to clear my personal outstanding bills as well some of my dad's medical bills and expenses. I was hoping that the money could tide me through until my next payday. "The repayment plan sounded reasonable: For a sum of $3,000, I had to return $268 x 12 months. I thought it was not bad." However, the moneylender asked Anon to make multiple payments to him instead, in order for her to borrow the sum. Anon detailed what happened next: "In order to get the $3,000, he transferred $500 to me and asked me to pay back $700 to create an account with his company because I was a new borrower." "On the day of repayment, he asked me to pay a deferment fee of $200. "Feeling like I had no choice, I did so via iBanking and sent him the receipt. "He confirmed that he received the monies." "The week after, the moneylender asked me to pay the $700. I used iBanking to do so and sent him a screenshot of the receipt." "This time round, he said his accounting department couldn't track an iBanking receipt. "He told me to make an ATM bank transfer by 7.30pm or he would charge me further deferment fees. "So, I quickly begged my friend and managed to bank in an additional $700 to them. "Bear in mind that by now, I had paid $1,600 for $500. "When I asked for the $3,000, he asked me for a further $1,000 to make my account "stronger", which I did after borrowing from my boss. "Again, I made an ATM bank transfer to him." "After I transferred the $1,000, he asked for a further sum of $1,300 to fully close the account in order to disburse the $3,000 ($700 + $1,000 + $1,300) plus $3,000 (supposed loan). "By now, I'd paid him $200 (deferment fee which I didn't ask for), $700 (repayment by iBanking), $700 (ATM transfer) and $1,000 (ATM transfer). "By this time, I realised that I have been scammed of my own money! "I decided not to give in regarding the $1,300 and demanded for him to return back my own money as I no longer intended to borrow from him. "I ended up giving him almost $3,000 rather than borrowing from him! "However, he simply ignored my pleas to return my money back. Even though I spoke harshly to him, he just kept asking me about the further $1,300." 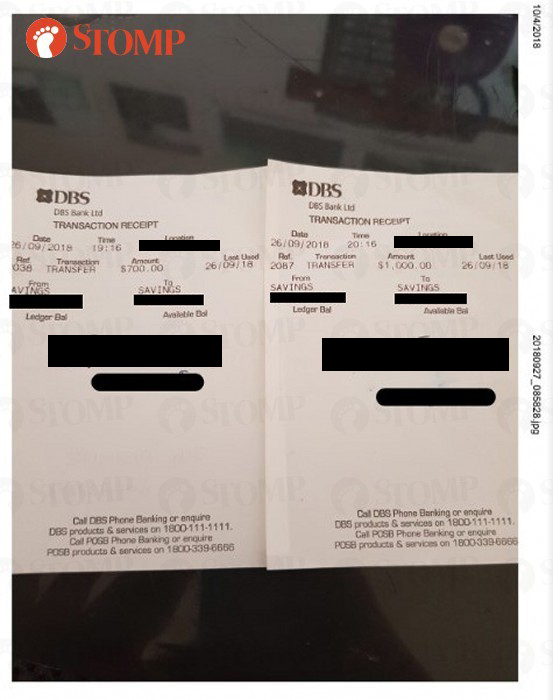 According to Anon, the moneylender continued sending her text messages and even called her office number. 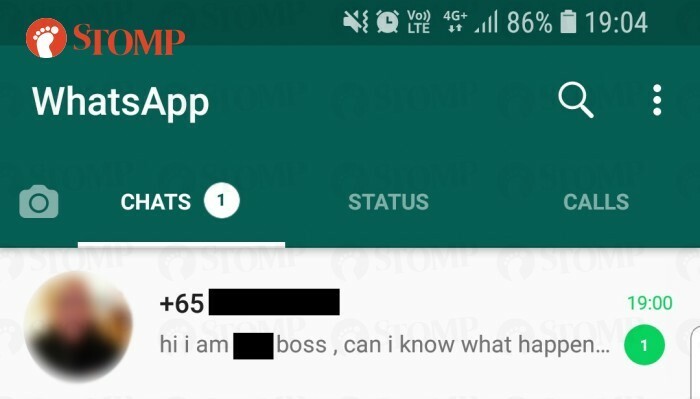 She also started receiving messages from someone who identified himself as the moneylender's boss. 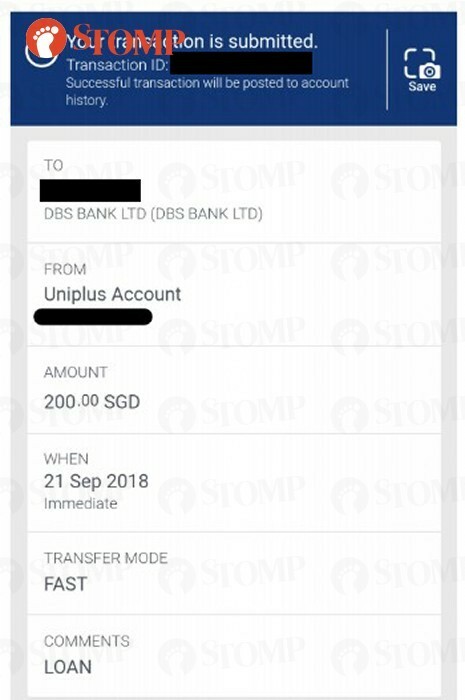 The Stomper, who ignored and blocked both numbers, made a police report on Sep 27. She added: "When I told the moneylender that I would report the matter to the police, he said to go ahead because the authorities can't do anything to him. "I admit it was a moment of foolishness on my part but that doesn't mean I have to tolerate this or live in fear. "I want to spread awareness and I really hope that this idiot gets caught by the authorities soon. Anyone with information, please contact the police hotline." 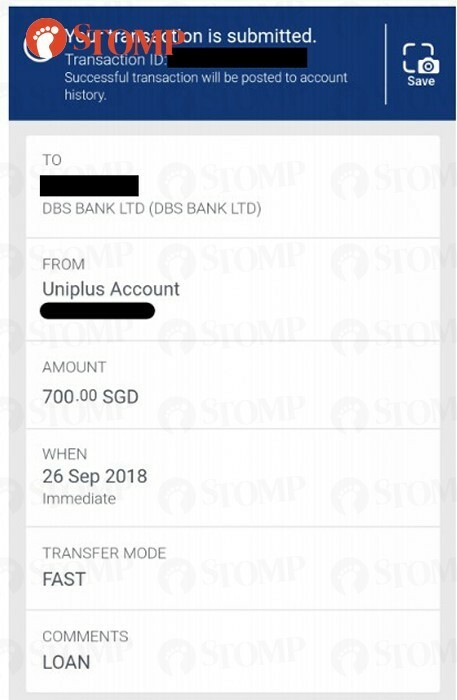 Anon told Stomp on Wednesday (Oct 17): "I received a letter from the bank that they have tried to ask the bank account holder to return the funds, but he/she declined to do so. "So that's it. My money is gone."